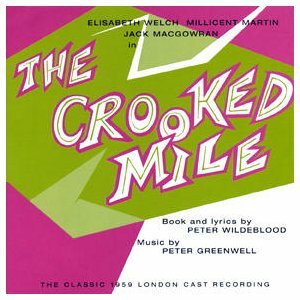 A look at London's Soho "low-life" of the 50s, this musical begins with a sinister melody that kind of warn us that this is going to be a dark score, but we soon discover that although it tells a story of a group of marginal characters with troubles this isn't a sad show, on the contrary. Peter Greenwell wrote a rich score that goes from conventional musical tunes to operatic levels and thanks to Gordon Langford's terrific orchestrations it has a lush sound that's high rewarding. There's a beautiful ballad, "If I Ever Fall in Love Again", sang with feeling by Elisabeth Welch that haunts the entire score and "Free" is a strong melody that kinds of set the feeling of the whole play. Besides the beautiful voiced Welch, there's the funny Millicent Martin who has a great time with "Horticulture" and shares in perfection a funny duet, "Meet the Family", with Welch. Jack MacGowran doesn't have a great voice but he delivers "Free" and the sad "Spare a Penny" with sentiment. Both John Larsen (who has an amusing duet with Welch, "Cousin Country", about the differences between English and Americans) and Alan Thomas have strong operatic voices to which they give full range in "Down to Earth" and "Luigi" respectively. I'm not going to say that this is a great score, but it deserves a place in any musical fan's cast album collection. You may not fall in love with it, but after a few listenings you'll find plenty to be pleased about.